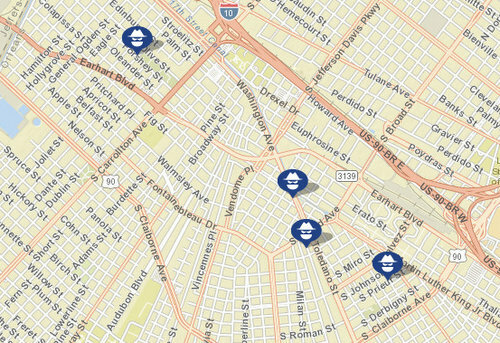 Five robbery-related incidents were reported around the Uptown New Orleans area over the first weekend of Mardi Gras parades, New Orleans police said. Around 8:20 a.m. Friday, Feb. 17, a man in his 20s was standing outside a vehicle in the 4300 block of Washington Avenue and another man in his 50s was inside of it when they were confronted by a man “armed with a long gun, possibly a rifle,” according to the initial NOPD report. The assailant pointed the gun at the younger man, took his wallet, then pointed it at the older man and took his belongings as well before leaving on Eve Street, the report states. Around 9 a.m. Saturday, a man in his 60s was working on a house in the 3900 block of Louisiana Avenue Parkway when he saw someone outside the gate “armed with a shotgun-type BB gun,” the report in that case states. About 20 minutes later, two men — one in his 30s, and the other in his 20s — were working on a house in the 3200 block of Leonidas when they were confronted by two assailants, one of whom had a BB gun. The gunman demanded their belongings while his accomplice went through their pockets, taking cash from both, the report states. The assailants ran off on Leonidas Street, and the victims chased them until they lost sight of them on Earhart Boulevard, the report states. The older man was shot in the chest during the incident, but he refused medical treatment, the report states. Around 9:40 p.m. Saturday, a man in his 30s was confronted by three attackers in the 3300 block of First Street, according to the report in that case. Finally, at 12:01 a.m. Monday, a man in his late 20s was near Erato and South Rampart streets when two people walked up, the report in that case states. One asked for a cigarette, and the other drew a gun and asked for money, the report states. The Explorer has a Louisiana license plate of XXN 671, the report states. Further details were not immediately available. Anyone with information in any of the above cases is urged to call CrimeStoppers at 822-1111 to leave an anonymous tip that could be eligible for a cash reward. It appears Robert pressed the “send” button prematurely? Thanks for the catch. Good to go now!